SCART stands for Syndicat francais des Constructeurs d’Appareils Radio et Television, and refers to the industry standard interface for physical and electrical interconnection between two pieces of audio-visual equipment, originated by the French company Peritel. Stereo audio, composite video, and control signals are provided in both directions. RGB video signals are input only. Most new television sets and VCRs in the European market and other countries that use the PAL video standard come equipped with one or more SCART connectors. Different cables can be made using SCART connectors to serve different purposes. For example, a cable for connecting a VCR or a TV set to a high-fidelity audio system needs to use only three of the 21 pins. The standard way of connecting older Audio Visual equipment in Europe – not the best way by a long chalk, but certainly the most common. 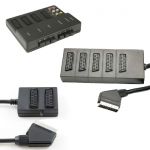 If you need SCART cables we have a huge range from which you can choose. If you can’t find what you’re looking for feel free to Get In Touch.